For this month’s design blog, we’re talking about an overlooked technique that brings a whole lot of attention to your content pieces: repetition. Repetition is especially important when creating digital signage content, since you’re going to have multiple campaigns running in succession. You’ll need consistency to tie them all together. Take a few minutes to watch the content playing on your signs and ask yourself these questions. Are your elements in the same place every slide, or is everything different from one slide to the next? Does one slide stand out from another, or do they all look the same? 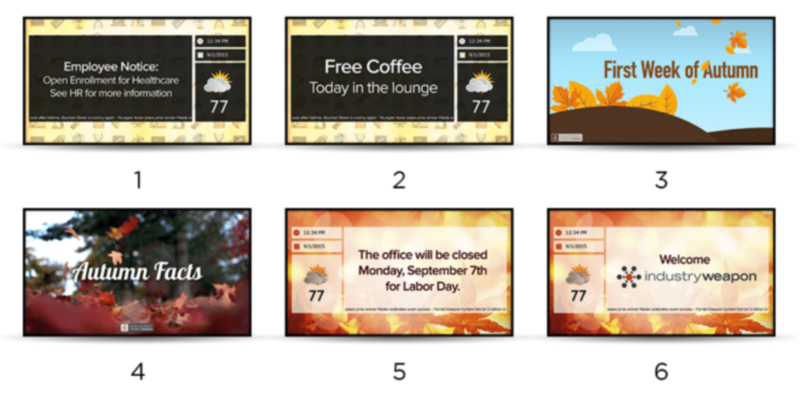 When designing digital signage, repetition refers to the use of the same or similar elements across multiple slides. This helps to make your campaigns flow together, while giving your channels a sense of unity and cohesiveness. Repetition does not mean that everything has to be exactly the same for each slide, because that would get boring very quickly. Instead, the real goal of repetition is to create slides that are similar enough so that they look like they’re all related, but different enough that people don’t start to ignore them. Imagine that these six slides are running back to back on your signs. They all have similar content on them, but each has this content in a different spot. Each slide is made in a separate campaign, using a separate template. Not only is this a lot of work to create and manage, but it also can lead to confusion for the viewer. By the time you read the first headline on that ticker, the slide will have transitioned to the next one, and the ticker will start over. If you glanced at the screen to check the time, the clock is moving from one corner to another on the next slide. So, what can we do to make these slides easier to digest, while saving time creating and managing your signs?